High Side - A particularly nasty type of crash where the rider can be bucked up and over the handlebars. Usually caused when the rear brake is released after a rear wheel lock up. When under power a motorcycle naturally keeps the two wheels in line. If the rear brake is over applied and the rear wheel locks up it will often slip out of line. 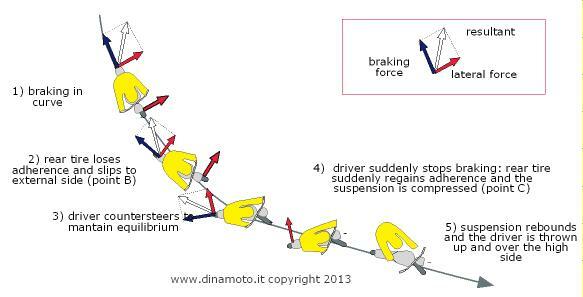 If that brake is released and power returns to the rear wheel it violently snaps back in line with the front wheel, often with catastrophic results for the rider. Forces occurring between the motorcycle and the road (such as those that result in accelerating, decelerating and turning) occur at the contact patch through friction and normal forces. There is a limited amount of force tangential to the road that the contact patch can transmit before the tire begins to lose traction, and therefore slide or skid. When going through a curve on a motorcycle, centripetal force (added to the other lateral forces such as acceleration or deceleration) is transferred from the road to the motorcycle through the contact patch, and is directed at a right angle to the path of travel. If the net force is greater than the static friction coefficient of the tire multiplied by the normal force of the motorcycle through the tire, the tire will skid outwards from the direction of the curve. Once a tire slips in a curve, it will move outwards under the motorcycle. What happens from there depends on how well the rider is able to restore balance and control. If the tire regains traction after the rider starts to skid while the motorcycle is moving sideways, the tire will stop its sideways movement causing the motorcycle to suddenly jerk into an upright position (and beyond). This movement can easily cause the rider to be thrown off and even expert riders are routinely thrown-off in highsides. 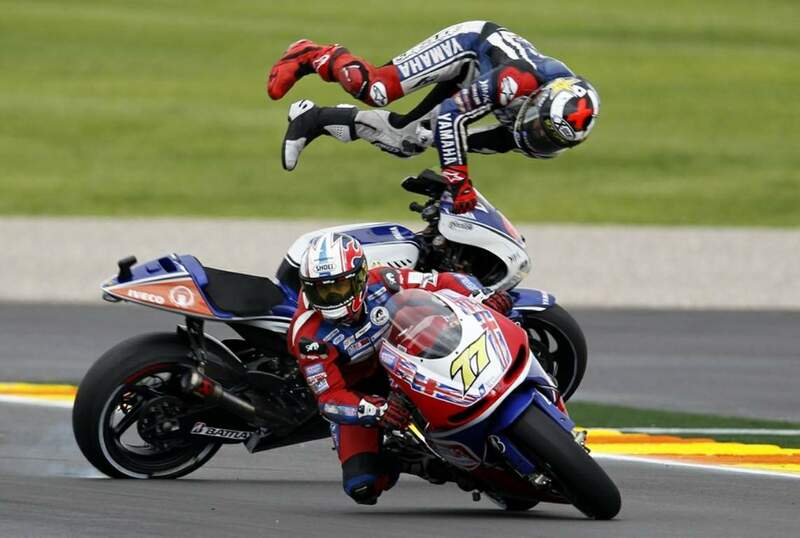 The name ("highside") derives from the side of the motorcycle that the rider will separate from. 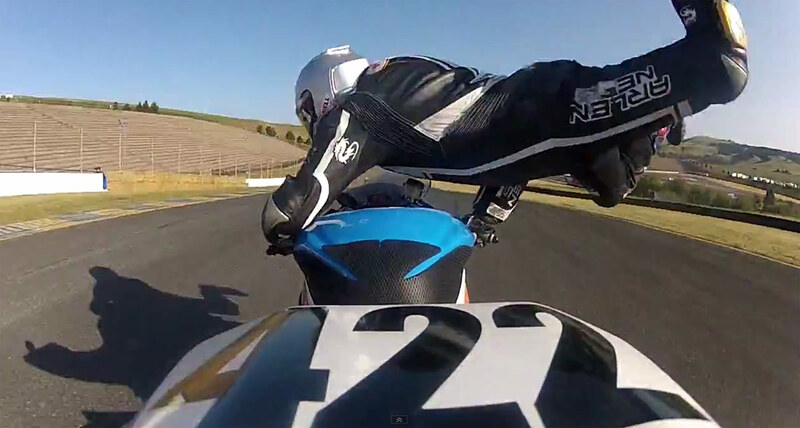 If forcibly thrown over the bike, the rider is said to have dismounted on the high side. 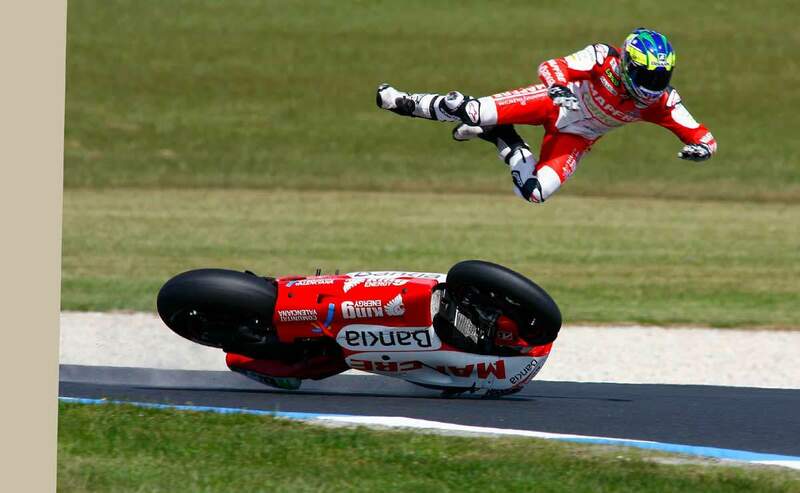 The highsider has the additional disadvantage of the rider's often being catapulted quite some feet into the air by the sudden jerking motion of the motorbike and the increased possibility of damage upon impact with the ground as well as being hit by the motorbike that is tumbling, bouncing and sliding behind the rider, threatening to crush him. It is somewhat like being thrown from a horse at full-gallop, except that a motorcycle can travel much faster than a horse and is generally ridden on hard-paved roads with plenty of roadside obstacles.